Lady Astor, by John Singer Sargent, 1909. Nancy Witcher Astor, Viscountess Astor, Companion of Honour (CH), (May 19, 1879 – May 2, 1964) was the first woman to serve as a Member of Parliament (MP) in the British House of Commons. She was the wife of Waldorf Astor, 2nd Viscount Astor. Born in the United States, her first marriage to Robert Gould Shaw ended in divorce. She moved to England in 1905. In she married the future Viscount Astor in 1906, who was himself elected to Parliament in 1910. When he succeeded to the title in 1919 and entered the House of Lords, Lady Astor stood for and won his vacant seat in the lower house. She retained her seat until her retirement in 1945. During her tenure, she did much to encourage women to enter the civil service, the police and to promote education reform. Her support for German re-armament because she saw the Third Reich as a potential ally in the battle against communism and because she shared Adolf Hitler's hatred of Jews and dislike of Catholics, however, meant that as World War II her views were out of sympathy with those of the British public. Her opposition to the war even earned her the title of "Hitler's woman in Britain" and "the Honourable Member from Berlin." On the one hand, she did not hold any political office, nor was she responsible for any major legislative achievement. On the other hand, she represented a formidable presence in the House, renowned for her wit and demonstrated that women in parliament could conduct themselves as competently as men. From a moral point of view, some of her beliefs were discriminatory and divisive. However, she did much to convince a nation, still skeptical about women's ability to contribute outside the home, that women could bring a different perspective, supplementing men's, into public discourse. Nancy Astor was born Nancy Witcher Langhorne on May 19, 1879, in Danville, Virginia, in the United States. Her mother was Nancy Witcher Keene, and her father was Chiswell Dabney Langhorne. The former business of her father had depended at least in part upon slave labor and had been badly damaged by the effects of the American Civil War. Because of this the Langhornes lived in near-poverty conditions for a period before she was born. That stated after her birth her father began regaining the family wealth. This started with work as an auctioneer and later through his involvement with the railroad. When she reached 13 years of age the Langhornes were again a rich family with a sizeable estate. Chiswell Langhorne later moved to Albemarle County. Nancy Langhorne had four sisters and three brothers. All of the sisters were known for their beauty; her sister Irene later married the artist Charles Dana Gibson and became a model for the Gibson girl. Nancy and Irene both went to a finishing school in New York City. In New York, Nancy met and married her first husband, Robert Gould Shaw, a relative of Robert Gould Shaw of Fort Wagner fame (a American Civil War battle), on October 27, 1897, when she was 18. This first marriage was a disaster. Shaw's friends accused Nancy of becoming puritanical and rigid after she married; Nancy's friends contended that Shaw was an alcoholic adulterer. The couple was married for four years and had one son, Bobbie. Nancy left Shaw numerous times during their brief marriage, the first time during their honeymoon. In 1903, Nancy's mother died and Nancy moved back to Mirador, her father's home in Albemarle County, Virginia. She tried to run the household for him but was unsuccessful. She left there and took a tour of England, and fell in love with the country while she was there. Because she was so happy there, her father suggested that Nancy move to England. Nancy was reluctant to go, so he suggested that the move had been her mother’s wish and that it would also be good for Nancy's younger sister, Phyllis, to accompany her. Nancy and Phyllis finally moved to England in 1905. The earlier trip to England had launched Nancy's reputation there as an interesting and witty American. Her tendency to be witty and saucy in conversation—yet religiously devout and almost prudish in behavior—confused many of the English men, but pleased some of the older socialites. They liked conversing with the lively and exciting American who at the same time largely conformed to decency and restraint. Nancy also began at this time to show her skill at winning over critics. She was once asked by an English woman, Mrs. Cunard, wife of the Cunard shipping magnate, "Have you come to get our husbands?" Her unexpected response, "If you knew the trouble I had getting rid of mine…" charmed her listeners and displayed the wit that would later become so famous. As a result of this reply, Mrs. Cunard and Nancy became life-long friends. Despite her protestations, however, she indeed married an Englishman. Her second husband, Waldorf Astor, was born in the United States but his father had moved the family to England when Waldorf was 12 and raised his children as English aristocrats. The pair was well matched from the start. Not only were they both American expatriates with similar temperaments, but they were even born on the exact same day. He shared some of her moral attitudes, and his heart condition may have encouraged him toward a restraint that she found comforting. The marriage's success, therefore, seemed assured. After the Astors married, Nancy moved into Cliveden, a lavish estate in Buckinghamshire on the River Thames, and began her life as a prominent hostess for the social elite. The Astors also owned a grand London house, No. 4 St. James's Square, which is now the premises of the Naval & Military Club. Through her many social connections, Lady Astor became involved in a kind of political circle called Milner's Kindergarten. Considered liberal in their age, the group advocated unity and equality among English-speaking people and a continuance or expansion of British imperialism. The group’s political significance was limited, but it yielded a much more significant result for Lady Astor personally. It was the source of her friendship with Philip Kerr, which was to be one of the most important relationships of her life. Indeed, it came at a critical juncture for both of them. The two met shortly after Kerr had suffered a spiritual crisis regarding his once devout Catholicism. The two of them were both searching for spiritual stability and their search led them toward Christian Science, to which they both eventually converted. Astor's beliefs and activities as a Christian Scientist would become one of the most consistent elements of her life. 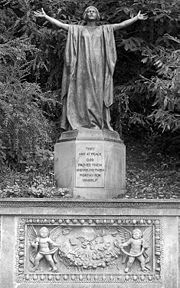 A statue at Cliveden, overlooking 42 inscribed stones dedicated to the dead of World War I. Sir Bertram MacKennal's figure represents Canada with the head reputedly modeled by Lady Astor. Astor's conversion was gradual and was influenced by a number of factors. Her sister Phyllis had given her Science and Health by Mary Baker Eddy because she thought Nancy might find it interesting. (Phyllis, however, never became a Christian Scientist.) At first Lady Astor had only marginal interest, but after a period of illness and surgery, she decided that those events had not been what God wanted. In the past she had been the type of person whose illnesses had largely been psychosomatic, so this rang true for her and she embraced the belief system wholeheartedly. Her former spiritual mentor and good friend, Archdeacon Frederick Neve, disapproved of her conversion and their relationship soured. Lady Astor's devotion to Christian Science was more intense than orthodox, and she sent some practitioners away for disagreeing with her. But she was deeply committed to her own interpretation of the faith and held to it almost fanatically. Many of her letters from that time on mentioned Christian Science, and letters from others to her joked about her efforts to convert peers to her beliefs. Philip Kerr's conversion came only after experimenting with Eastern religion, but he later became a spiritual advisor for Astor. In time, his bitter rejection of Catholicism also influenced Lady Astor, intensifying her opinions in that direction. She was also affected when her friendship with Hillaire Belloc, who was Catholic, began to grow cold because of his disdain for the rich and her efforts to convert his daughters to Christian Science. The loss of that relationship further alienated her against Roman Catholicism. During World War I Cliveden was turned into a hospital for Canadian soldiers. Although Astor, as a Christian Scientist, did not believe in the use of medical practices, she got along well with doctors, especially a surgeon named Colonel Mewburn. She justified her position there by helping those who needed non-medical assistance. This work built a public image of Lady Astor as a friend to soldiers, and that proved useful when she ran for office. At the same time, horrible poison gas attacks and the deaths of friends turned her against war itself. 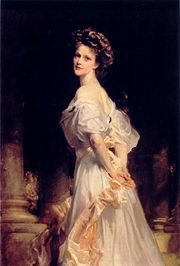 Several elements of Lady Astor's life to this point influenced her first campaign, but the main reason she became a candidate in the first place was her husband's situation. He had enjoyed a promising career for several years before World War I in the House of Commons serving as parliamentary secretary to the Prime Minister, but then he succeeded to his father's peerage as the 2nd Viscount Astor. This meant that he automatically became a member of the House of Lords and forfeited his seat of Plymouth Sutton in the House of Commons. So Lady Astor decided to contest the vacant parliamentary seat. Astor had several disadvantages in her campaign. One of them was her lack of connection with the women's suffrage movement. The first woman elected to the British Parliament, Constance Markiewicz, said Lady Astor was "of the upper classes, out of touch." While Lady Astor was the first female member of the House of Commons who actually took up her seat, she was not the first woman to be elected to the House. Markiewicz did not take up her seat because of her Irish nationalist views. Later, however, as a member of the Irish legislature, she became the first women in Europe to become a cabinet minister. Countess Markiewicz had been in Holloway prison for Sinn Féin activities during her election, and other suffragettes had been imprisoned for arson; Astor had no such background. Despite her comments about Lady Astor being of the "upper classes," Markiewicz was herself the daughter of a baronet. Even more damaging to Astor's campaign were her well-known hostility to alcohol consumption and her ignorance of current political issues. These points did not endear her to the people of Plymouth, the constituency from which she was elected. Perhaps worst of all, her tendency to say odd or outlandish things sometimes made her look rather unstable. However, Astor also had some positive attributes in her campaign, such as her earlier work with the Canadian soldiers, her other charitable work during the war, her vast financial resources for the campaign and, most of all, her ability to improvise. Her ability to turn the tables on the hecklers was particularly useful. Once a man asked her what the Astors had done for him and she responded with, "Why, Charlie, you know," and later had a picture taken with him. This informal style baffled yet amused the British public. She rallied the supporters of the current government, was pragmatic enough to moderate her Prohibitionist views, and used women’s meetings to gain the support of female voters. A by-election was held on 28 November, 1919, and she took up her seat in the House on December 1 as a Unionist (also known as "Tory") Member of Parliament. She speaks rarely. Her voice is, in the upper notes, a little harsh (a common fault among fashionable women in England), has one or two good deep notes but no intermediate tones. There are faint traces of an American accent…. She is clearly not an intellectual woman, and her influence in parliament, which is rather greater than is generally thought, is due to purely feminine qualities. Conspicuous among these are motherly wit, simplicity, naturalness … . Contrary to Countess Markiewicz's remarks about her as "out of touch," though, Sidebotham also commented that "in spite of her millions, it is noticeable that the average working man gets her women's point of view much more quickly than the average middle class man." Early in her first term, a fellow Member of Parliament named Horatio Bottomley, who felt Astor was an obstacle in his desire to dominate the "soldier’s friend" issue, sought to ruin her political career. He did this by capitalizing on the first substantial controversies in which she participated, namely her opposition to divorce reform and her efforts to maintain wartime alcohol restrictions. He depicted her as a hypocrite in his newspaper, saying that the divorce reform bill she opposed allowed women to have the kind of divorce she had had in America. However, a budget crisis and his bitter tone caused this effort to backfire. Bottomley eventually went to prison for fraud, a fact that Astor used to her advantage in later campaigns. Among her early political friends were the first female candidates to follow her to Parliament, including members of the other parties. The first of them began when Ellen Wintringham was elected after Astor had been in office for two years, but the most surprising might have been her friendship with "Red Ellen" Wilkinson, a former Communist representative in the Labour Party. Astor later proposed creating a "Women’s Party," but the female Labour MPs thought it was a ridiculous idea because at that time their party had power and promised them positions. Astor conceded this, but her closeness with other female MPs dissipated with time and by 1931 she even became hostile to female Labour members like Susan Lawrence. Unlike most of the other women, Lady Astor's accomplishments in the House of Commons were relatively minor. She never held a position of much influence. Indeed, the Duchess of Atholl (elected in 1923) rose to higher levels in the Tory Party before Astor did, and this was largely as Astor wished. She felt that if she had a position in the party, she would be less free to criticize her party’s government. One of her few significant achievements in the House was the passage of a bill she sponsored to increase the legal drinking age to 18 unless the minor has parental approval. However, there are few opportunities in the British parliamentary system for private members to sponsor legislation, so lack of achievement in this area is by no means untypical for someone who sits on the back-benches. Lady Astor did do some significant work outside the political sphere. The most famous was her support for nursery schools. Her involvement with this cause was somewhat surprising in a way because the woman who first focused her attention on it was a Socialist named Margaret McMillan who believed that her dead sister still had a role in guiding her. Lady Astor was initially skeptical, but later the two women became close and Astor used her wealth to aid their efforts. Astor's positive traits and good works do not negate the fact her political career displayed some cruelty and callousness. On hearing of the death of a political enemy, she openly expressed her pleasure. When people complained about this, she did not apologize but instead said, "I’m a Virginian; we shoot to kill." A friend from Virginia, Angus McDonnell, had angered her when he married without consulting her after having agreed to seek her permission first. She later told him, regarding his maiden speech, that he "really must do better than that." In addition to these, she also alienated several others with her sharp tongue throughout her life. The 1920s were Astor's most positive period in Parliament, when she made several effective speeches and introduced a bill that passed. Although she was not always the ideal Member of Parliament, her wealth and striking persona brought some attention to women in the House. She worked to bring more women into the civil service and the police force and to reform education and the House of Lords. In addition, she remained popular in her district and well liked in the U.S. during the 1920s, but this period of success would not continue forever. Unlike the previous decade, the 1930s would be one of personal and professional difficulty for Lady Astor. An early sign of future problems came in 1928 when she only barely defeated the Labour candidate. In 1931 her problems became more acute when her son from her first marriage, Bobbie, was arrested for homosexuality. Because Bobbie had previously shown tendencies toward alcoholism and instability, Astor's friend Philip Kerr, now Marquess of Lothian, told her that the arrest might be positive for him. This would turn out to be incorrect. Astor also made a disastrous speech stating that the England cricket team lost to the national Australian cricket team because of alcohol use. Both the English and Australian teams objected to this. Astor remained oblivious to her growing unpopularity almost to the end. A mixed element in these difficult years was Astor's friendship with George Bernard Shaw. He helped her through some of her problems, but also made some things worse. Their friendship was somewhat peculiar because they held opposing political views and had very different temperaments, but he liked her as a fellow non-conformist, and she had a fondness for writers in general. Nevertheless, his tendency to make controversial statements or put her into awkward situations proved to be a drawback for her. After Astor's son Bobbie was arrested, Shaw invited her to accompany him on his trip to the Soviet Union. Although it was helpful in some ways, this trip turned out to be bad overall for Lady Astor's political career. During the trip Shaw made many flattering statements about Stalinist Russia, while Nancy often disparaged it because she was generally not in favor of Communism. She even asked Stalin point-blank why he had slaughtered so many Russians, but many of her criticisms were translated into innocuous statements instead. This led many of her conservative supporters to fear she had "gone soft" on Communism. Even her question to Stalin may have been likewise translated if he had not insisted that he be told what she had actually said. Furthermore, Shaw's praise of the USSR made the trip seem like a coup for Soviet propaganda and made her presence there disturbing for the Tories. As bad as the Soviet trip was, it was minor compared to what would follow. Although Astor had criticized the Nazis for devaluing the position of women, she was also adamantly opposed to another World War. Several of her friends and associates, especially Lord Lothian (Philip Kerr), became heavily involved in the German appeasement policy; this group became known as the "Cliveden set." The term was first used in the newspaper, The Week, run by reformist Claud Cockburn; excitement over it grew and the allegations became more elaborate. The Cliveden set was seen variously as the prime mover for appeasement, or a society that secretly ran the nation, or even as a beachhead for Nazism in Britain. Astor was viewed by some as Adolf Hitler’s woman in Britain, and some went so far as to claim that she had hypnotic powers. As fiercely anti-Communist as they were anti-Semitic, Kennedy and Astor looked upon Adolf Hitler as a welcome solution to both of these "world problems" (Nancy's phrase)…. Kennedy replied that he expected the "Jew media" in the United States to become a problem, that "Jewish pundits in New York and Los Angeles" were already making noises contrived to "set a match to the fuse of the world." Evidence supporting these allegations is weak, but Astor did occasionally meet with Nazi officials in keeping with Neville Chamberlain's ideals. She told one such Nazi official, who later turned out to be trying to ruin the Nazis from within, that she supported their re-armament. However, she did so because Germany was "surrounded by Catholics" in her opinion. She also told Joachim von Ribbentrop, the German ambassador who would later become the Foreign Minister of Germany, that Hitler looked too much like Charlie Chaplin to be taken seriously. These statements are the only documented incidents of Nazi sympathy of any kind, although it is true that she distrusted and disliked British Foreign Secretary (and later Prime Minister) Anthony Eden, stating that the more she saw of him the "more certain" she was that he would "never be a Disraeli." Lady Astor seemed largely unconcerned by the fact that so many of her public statements caused difficulties. She became even harsher in her anti-Catholicism and anti-Communism. After passage of the Munich Agreement, she said that if the Czech refugees fleeing Nazi oppression were Communists, they should seek asylum with the Soviets instead of the British. Even supporters of appeasement felt this insult to be out of line, but Lord Lothian encouraged her attitudes. He railed against the pope for not supporting Hitler's annexation of Austria and in many ways continued to influence Lady Astor. When war did come, Astor admitted that she had made mistakes, and even voted against Chamberlain, but hostility remained. She was taken far less seriously than before, with some calling her "The Honourable Member for Berlin." In addition, her abilities as an MP had declined with age. Her increasing fear of Catholics led her to make a speech regarding her belief that a Catholic conspiracy was subverting the foreign office. Her long-time hatred of Communists continued and she insulted Stalin's role as an ally during the war. Her speeches became rambling and incomprehensible, and even her enemies lamented that debating her had become "like playing squash with a dish of scrambled eggs". She had become more of a joke than an adversary to her enemies. The period from 1937 to the end of the war was traumatic on a personal level. In the period of 1937-1938 both Astor's sister Phyllis and her only surviving brother died. In 1940 her close friend and spiritual adviser Lord Lothian died as well. Although his influence had a definite negative aspect, he had been her closest Christian Scientist friend even after her husband converted. George Bernard Shaw’s wife also died about two years later. During the war, Astor got into a fight with her husband about chocolate and soon after he had a heart attack. After this, their marriage grew cold, probably due at least in part to the harsh effects of such a petty argument and her subsequent discomfort with his health problems. She ran a hospital for Canadian soldiers as she had before, but openly expressed a preference for the veterans of the previous World War. It is generally believed that it was Lady Astor who, during a World War II speech, first referred to the men of the 8th Army who were fighting in the Italian campaign as the "D-Day Dodgers." Her implication was that they had it easy because they were avoiding the "real war" in France and the future invasion. The Allied soldiers in Italy were so incensed that they composed a bitingly sarcastic song to the tune of the haunting German song Lili Marleen (popularized in English by Marlene Dietrich) that they called "The Ballad Of The D-Day Dodgers," written by Major Hamish Henderson of the 51st Highland Division. She also made a disparaging remark about troops involved in the Burma Campaign, warning the public to "Beware the men with crows' feet." This was an allusion to the white lines often found around the eyes of white soldiers in hot climates due to squinting in the bright sunlight as it tanned their faces. Soldiers of the 14th Army were slightly bemused to be accorded such attention and it was strongly rumored among them that her prejudice was the result of a 14th Army officer on leave either impregnating Astor's daughter or infecting her with a sexually transmitted disease. Lady Astor did not feel that her final years were a period of personal decline. Instead, in her opinion, it was her Party and her husband who caused her retirement in 1945. The Tories felt that she had become a liability in the final years of World War II, and her husband told her that if she ran for office again the family would not support her. She conceded, but with irritation and anger, according to contemporary reports. Lady Astor's retirement years proved difficult, especially for her marriage. She publicly blamed her husband for forcing her to retire; for example, in a speech commemorating her 25 years in office she stated that her retirement was forced on her and that it should please the men of Britain. The couple began traveling separately and living apart soon after. Lord Astor also began moving to the left, politically, in his last years, and that exacerbated their differences. However, the couple reconciled before his death on September 30, 1952. This period also proved to be hard on Lady Astor's public image. Her racial views were increasingly out of touch with cultural changes, and she expressed a growing paranoia regarding ethnic minorities. In one instance she stated that the President of the United States had become too dependent on New York City. To her this city represented "Jewish and foreign" influences that she feared. During her U.S. tour she also told a group of African American students that they should aspire to be like the Black servants she remembered from her youth. On a later trip she told African American church members that they should be grateful for slavery because it had allowed them to be introduced to Christianity. In Rhodesia she proudly told the White minority government leaders that she was the daughter of a slave owner. After 1956 Lady Astor became increasingly isolated. Her sisters had all died, "Red Ellen" Wilkinson committed suicide in 1947, George Bernard Shaw died in 1950, and she did not take well to widowhood. Her son Bobbie became increasingly combative and after her death he committed suicide. Her son Jakie married a prominent Catholic woman, which hurt his relationship with his mother, and her other children became estranged from her. Ironically, these events mellowed her and she began to accept Catholics as friends. However, she stated that her final years were lonely. Lady Astor died in 1964 at her daughter's home at Grimsthorpe in Lincolnshire. She was buried in Buckinghamshire, England. But by far the most famous were her frequent sharp exchanges with Winston Churchill. He once told her that having a woman in Parliament was like having one intrude on him in the bathroom, to which she retorted, "You’re not handsome enough to have such fears." Another time when Lady Astor was giving a costume ball, Churchill asked her what disguise she would recommend for him. She replied, "Why don't you come sober, Prime Minister?" The most famous of all such anecdotes occurred when Lady Astor said to Churchill, "If you were my husband, I'd poison your tea." To which he responded, "Madam, if you were my wife, I'd drink it!" In his not especially flattering sketch of Lady Astor's career, Sidebotham commented that while her place in history was secure as the first women member of the House of Commons, her place in that house was still uncertain. He described her "Parliamentary achievement" as of 1921 as "not great." He may have made the same comment after she retired, since she did not occupy a government post. However, he also commented that she did render a significant service, which was not to discuss "men's politics" as men did but to "introduce new subjects that men have overlooked, and new points of view not even suspected." A member of parliament's task, whether a man or a woman, is to represent their constituency, which includes men and women. They are not tasked to represent only men or only women. On the other hand, all members bring to their Parliamentary work a set of interests, expertise and skills which enables them to contribute to particular areas of concern; all legislators are also mandated to address national and international concerns as well as those that impact more immediately on their own constituencies. The presence of more women in parliament, ideally, ought to introduce different insights and bring a different set of qualities than those normally associated with men, into play. Regardless of her lack of legislative achievement and the fact that she did not occupy a ministry, Lady Astor made a valuable political contribution by showing that the presence of women in parliament drew attention to "new subjects" and "new points of view" not even "suspected" by men, supplementing and enriching the male perspective. Some of Lady Astor's views, from a moral perspective, were discriminatory and divisive, so it may have been fortuitous that she possessed influence rather than exercised power. ↑ Courtney Wilson, “Our Nancy”: The Story of Nancy Astor and Her Gift to the University of Virginia. University of Virginia. Retrieved September 16, 2008. ↑ Langhorne House, birthplace of Lady Astor. Official Tourism Website of the Commonwealth of Virginia. Retrieved September 16, 2008. ↑ Mirador. Historical Marker, The Historical Marker Database. Retrieved September 16, 2008. ↑ Karen J. Musolf. From Plymouth to Parliament. (St. Martin’s Press, 1999), 15. ↑ Herbert Sidebotham, "Lady Astor." 175-184, in Political Profiles from British Public Life. (New York, NY: Houghton Mifflin, 1921), 176. ↑ Christopher Sykes. Nancy: the life of Lady Astor. (New York, NY: Harper & Row, 1984), 247. ↑ J.P. Wearing, (ed.) Bernard Shaw and Nancy Astor. (Toronto, CA: University of Toronto Press, 2004), xix. ↑ Harold Nicolson in a letter to his sons, 18 March 1943. Wearing. 2004. page xiv. ↑ Nancy Astor, British Politician. The Quotations Page. Retrieved September 16, 2008. ↑ Quotation search. The Quotations Page. Retrieved September 16, 2008. ↑ Musolf, 1999, 15. See also Witty Quotes. Did You Know. Retrieved September 13, 2008. Astor, Michael. 1964. Tribal Feelings. London, UK: Readers Union. Cowling, Maurice. 1975. The Impact of Hitler - British Policies and Policy 1933-1940. Cambridge, UK: Cambridge University Press. ISBN 0521205824. Musolf, Karen J. 1999. From Plymouth to Parliament. St. Martin’s Press. ISBN 9780312213640. Masters, Anthony. 1981. Nancy Astor: A Biography. New York, NY: McGraw Hill. ISBN 9780070407848. Thornton, Martin ed. 1987. Nancy Astor’s Canadian Correspondence, 1912-1962. Lewiston, NY: Edwin Mellen Press. ISBN 9780773484528. Sykes, Christopher. 1984. Nancy the life of Lady Astor. New York, NY: Harper & Row. ISBN 9780060141844. Sidebotham, Herbert. 1921. "Lady Astor." 175-184 Political Profiles from British Public Life. New York, NY: Houghton Mifflin. Wearing, J.P. ed. 2004. Bernard Shaw and Nancy Astor. Toronto, CA: University of Toronto Press. ISBN 9780802037527. Nancy Astor at the Internet Movie Database. Portrait of Nancy Langhorne Shaw Astor, by Edith Leeson Everett, Virginia Historical Society, Richmond, Virginia. History of "Nancy Astor, Viscountess Astor"
This page was last modified on 6 November 2018, at 00:45.